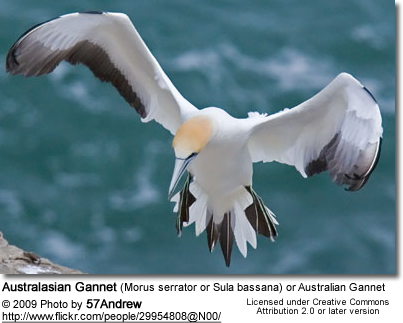 The Australasian Gannet (Morus serrator or Sula bassana, also Australian Gannet, Tākapu) is a large seabird of the gannet family Sulidae. Young birds are black in their first year, and gradually acquire more white in subsequent seasons until they reach maturity after five years. Adults have a white body with dark wing tips, and the head is yellow with a pale blue-grey bill. 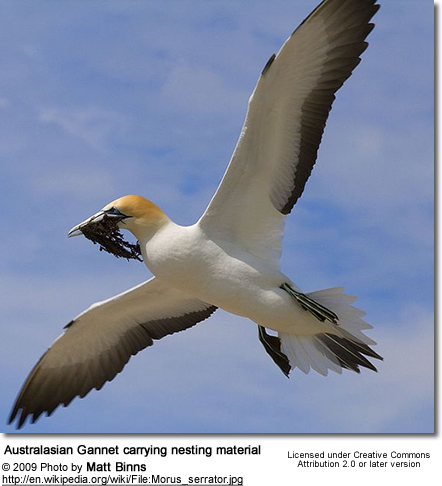 Their breeding habitat is on islands off Victoria, Tasmania and New Zealand. They normally nest in large colonies on coastal islands. 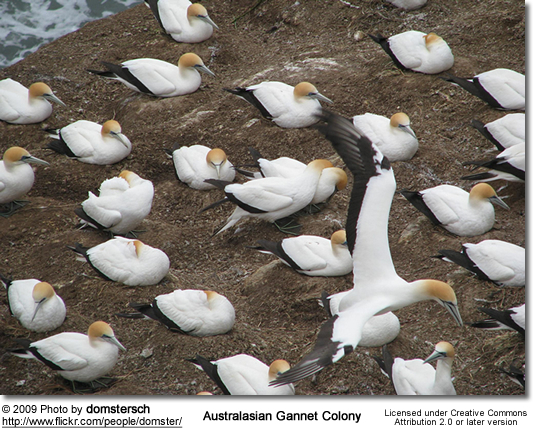 A large exception is the protected colony on the mainland at Cape Kidnappers (5000 pairs). 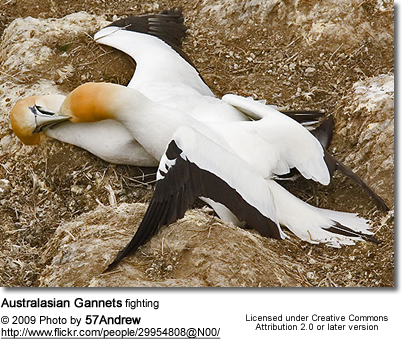 Gannet pairs may remain together over several seasons. They perform elaborate greeting rituals at the nest, stretching their bills and necks skywards and gently tapping bills together. The adults mainly stay close to colonies, whilst the younger birds disperse. These birds are plunge divers and spectacular fishers, plunging into the ocean at high speed. They mainly eat squid and forage fish which school near the surface. 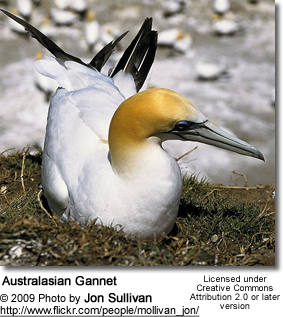 Numbers of Australasian Gannet have been increasing since 1950, although some colonies have disappeared and others have decreased in size.